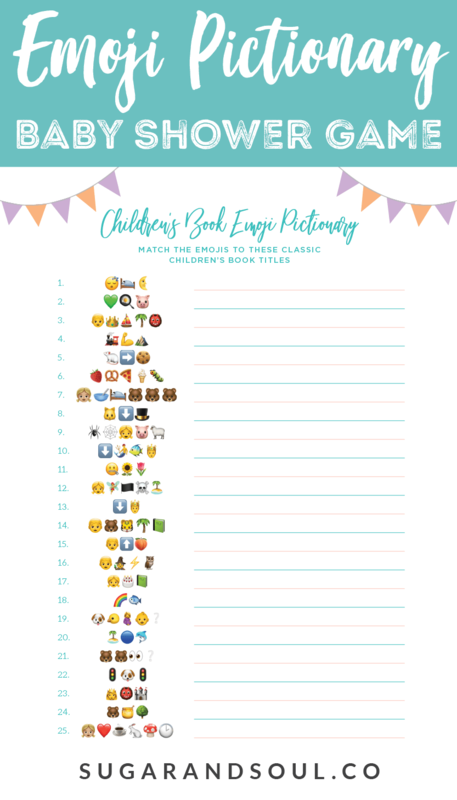 This FREE Emoji Pictionary Baby Shower Game Printable uses emoji images to guess the name of each book! It’s a fun and new game idea everyone will love playing! Raise your hand if you’ve been to a baby shower and played games that you’ve played at a million others. Yep, we all have. 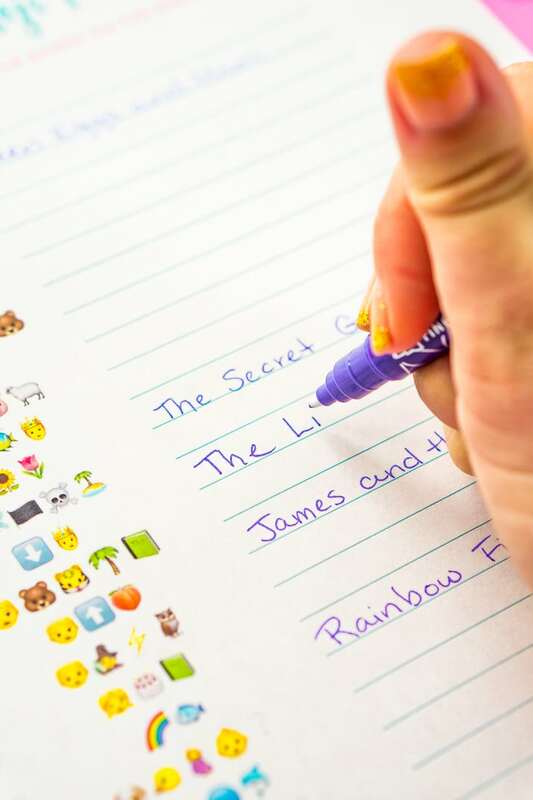 But this Children’s Book Emoji Pictionary is a fun, new shower game that is sure to be a hit and a little different than all the ones you’ve played before! Emoji Pictionary games have been around for a little while now, but they’re still new enough that most people haven’t played one. This Children’s Book theme makes people think (but not too hard) and everyone always loves it! The idea behind this game is that the emojis are hints to the title of a children’s book. There are 25 book titles in total that need to be filled in and most of them are classics that people of all ages should be able to figure out! The person who has the highest number of correct titles once the time is up wins! Don’t forget to give them a prize – we love homemade sugar scrubs, lip balm, and wine as gift ideas! I made this FREE baby shower printable for my own shower a few weeks ago and thought you guys might enjoy playing it too! I’ve included a few helpful notes about that game and then you can scroll down to the bottom of the post to get the came itself! Have everyone start with their game sheet face down. This gives everyone a fair chance to compete! Time the game. This one might really depend on your audience, but I think 3 minutes is a good time for this game. With 5 minutes almost everyone will have filled out the sheet. Have fun! Because that’s the important part! It was designed to be printed on 8.5×11-inch sheets of paper. It’s best when printed in color due to the small images. The printable game sheet and answer key are two separate files, so make sure you get both, I did it this way so it was easier to print multiples of the game and just one of the answer key. You might also enjoy my Are You My Mother Printable Baby Shower Game! Get the FREE Printable Baby Shower Game! Baby Shower Emoji GamePrint Now! You’ll Also Need to Get the Answer Key, please click the button below to grab it! Pin this Printable Baby Shower Game for Later! Hello. How do I get the answers to the game? This seems like such a fun game can’t wait to play! What an awesome idea. This looks fun! How do I get the printable version? Hi Siya, I sent you an email. Can someone please email Me the answer sheet to? Link isn’t working. Thanks so much. 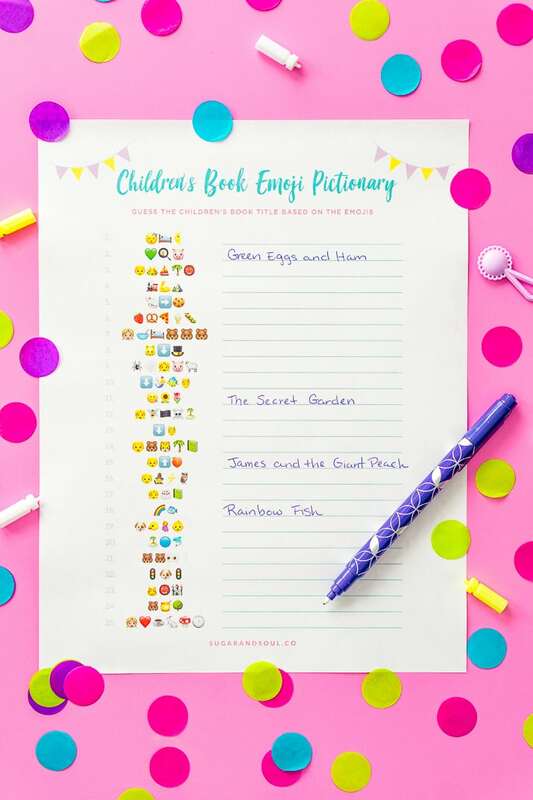 Hi Lauren, it looks like we’re having some technical difficulties, you can find the answer key here: https://www.sugarandsoul.co/wp-content/uploads/2018/08/Childrens-Book-Emoji-Pictionary-Baby-Shower-Game-Printable-Answer-Key.pdf and I have also emailed it to you. I had no trouble downloading the game, but can’t seem to get the answers. Help, please. 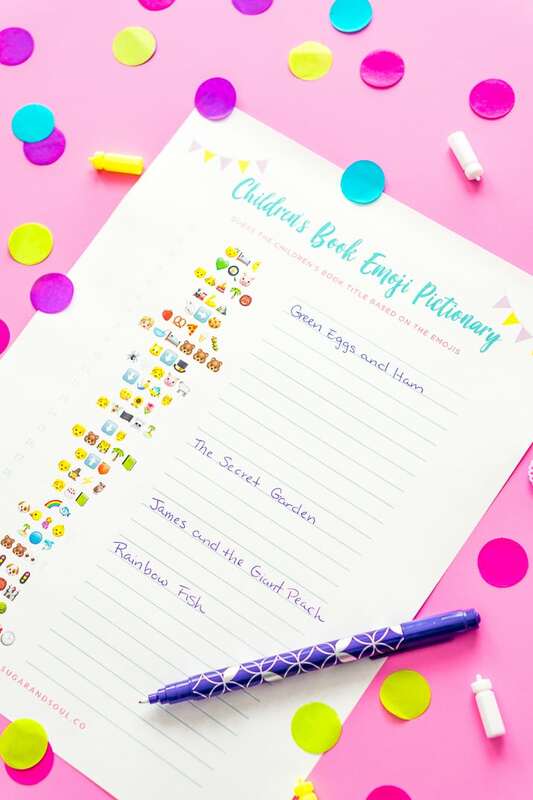 Hi Cheryl, it looks like we’re having some technical difficulties, you can find the answer key here: https://www.sugarandsoul.co/wp-content/uploads/2018/08/Childrens-Book-Emoji-Pictionary-Baby-Shower-Game-Printable-Answer-Key.pdf and I have also emailed it to you. 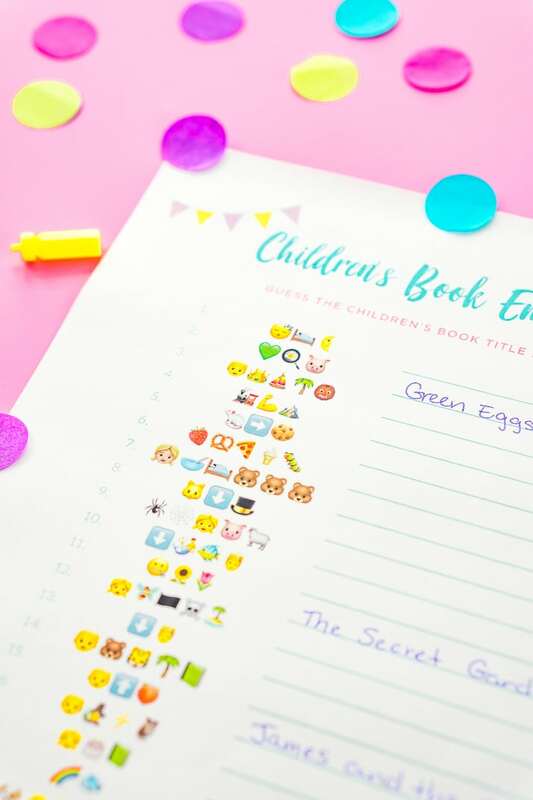 Hi Hallie, it looks like we’re having some technical difficulties, you can find the answer key here: https://www.sugarandsoul.co/wp-content/uploads/2018/08/Childrens-Book-Emoji-Pictionary-Baby-Shower-Game-Printable-Answer-Key.pdf and I have also emailed it to you. Hi Martina, it looks like we’re having some technical difficulties, you can find the answer key here: https://www.sugarandsoul.co/wp-content/uploads/2018/08/Childrens-Book-Emoji-Pictionary-Baby-Shower-Game-Printable-Answer-Key.pdf and I have also emailed it to you. Hi!!! I was able to download just the game but no answer key. Could you please email me? 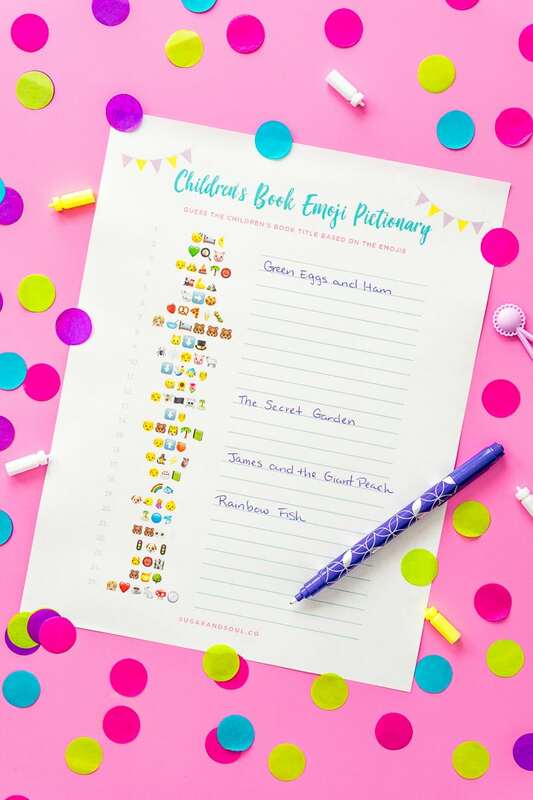 Hi Sasha, it looks like we’re having some technical difficulties, you can find the answer key here: https://www.sugarandsoul.co/wp-content/uploads/2018/08/Childrens-Book-Emoji-Pictionary-Baby-Shower-Game-Printable-Answer-Key.pdf and I have also emailed it to you. You really need to change the color on the answer sheet. The blue for the answers is very hard to read. Hi Michelle, I don’t have you listed as a subscriber, the confirmation email may have gone to your spam or junk folder, I will email you directly. Hi Mai, Are the emojis showing up at all or just in black and white? I would try printing it from another computer to see if that helps. It’s possible that the graphics card in your computer isn’t registering the emojis or that your printer isn’t.